Today I, Zeb the Duck, will show you some elementary schools. 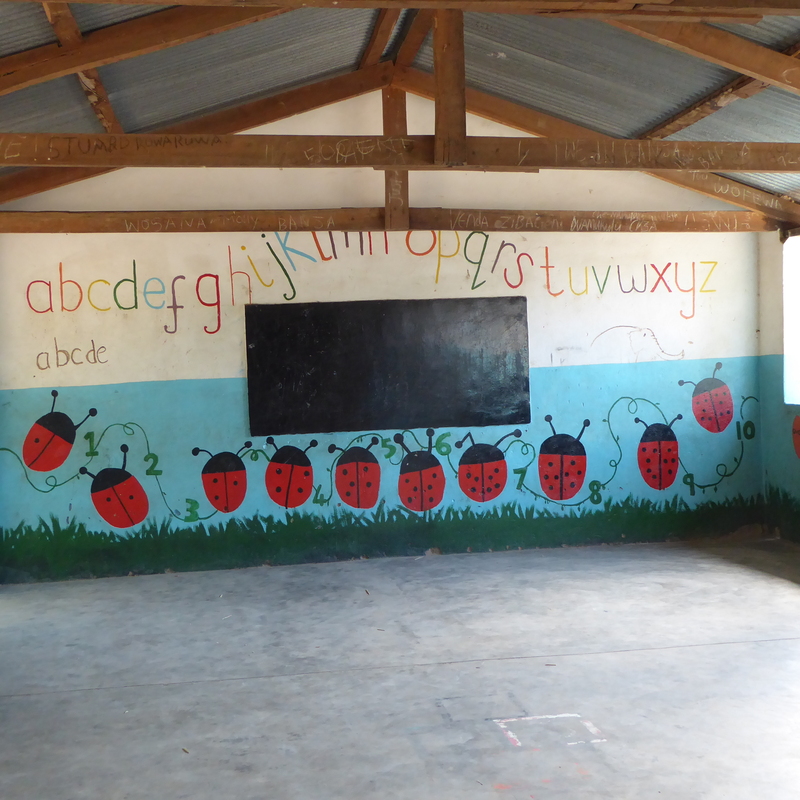 Inside the classroom, the walls help teach the alphabet, and counting with the lady bugs. 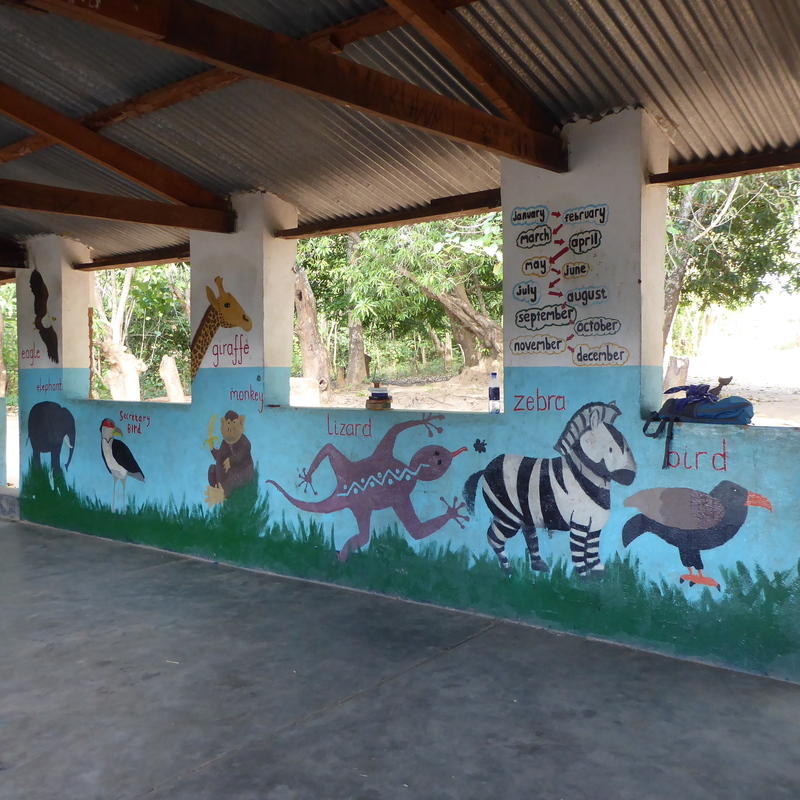 Another wall has animals and the months painted. 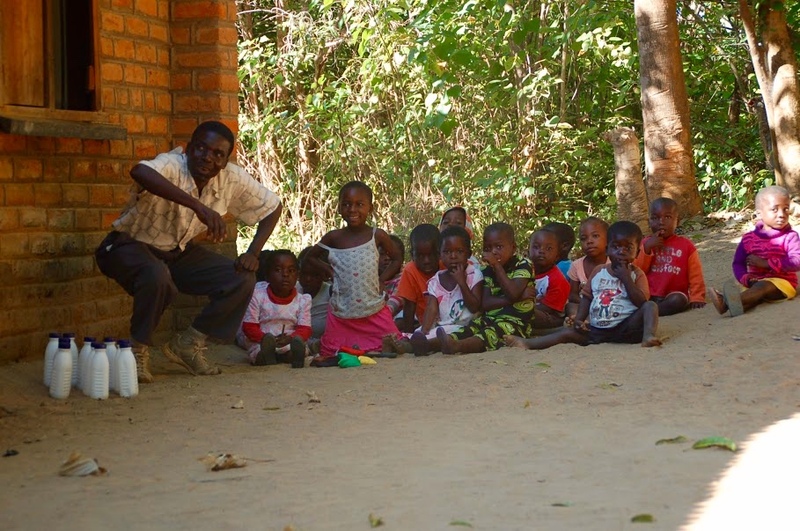 There are no windows and no doors in these classrooms. 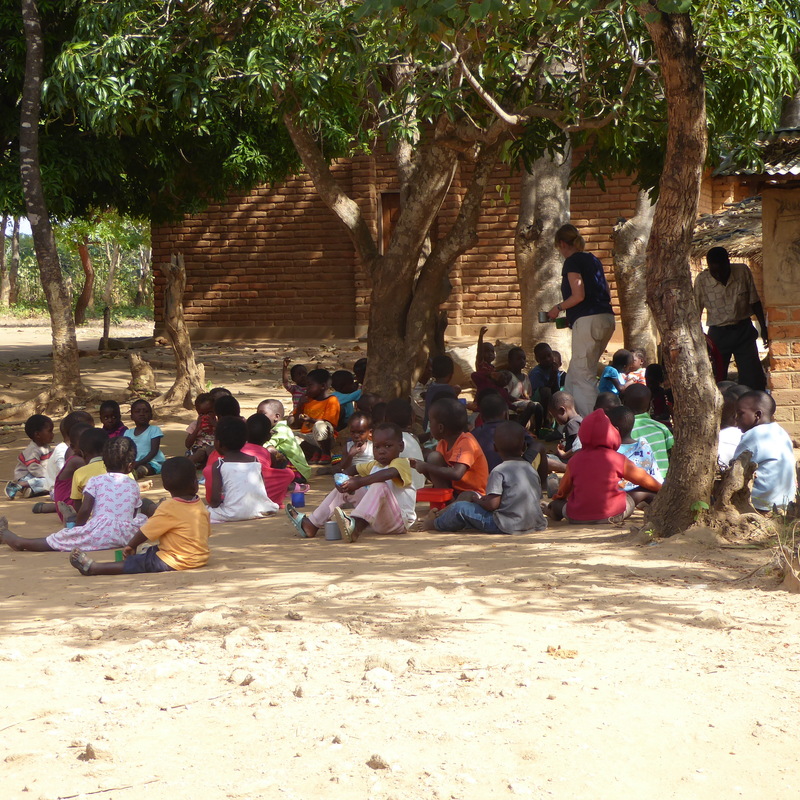 The students are very eager to learn and very well behaved. These students are moving to another group. Students sit on the floor, there are no desks and chairs, waiting for instructions from the teachers. This small group is working outside with the bottles. They are practicing their numbers. 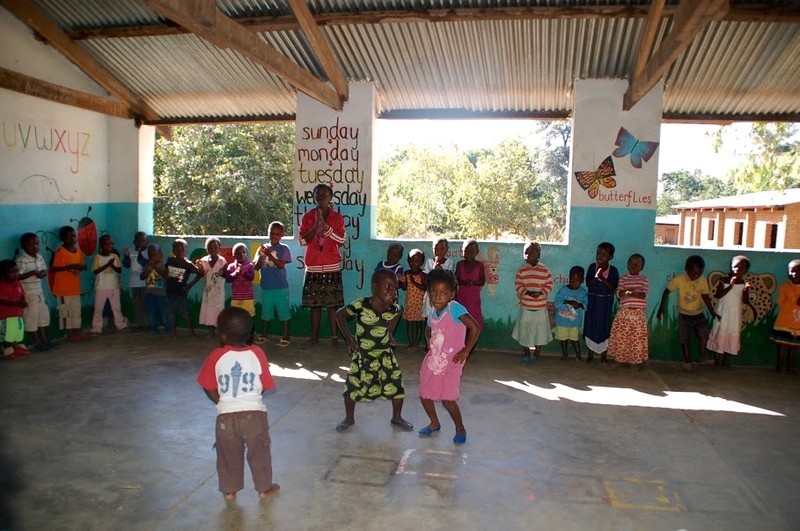 There are no physical education classes, so teachers have the students form a large circle around the room. Large circle around classroom. Song and dancing time. Time for singing and dancing now. Each student has a turn in the center of the circle. There was much singing and dancing here. I, Zeb the Duck, stayed in my traveling bag as I do when children are around, but I heard so much excitement and joy in the singing. This is a very happy classroom. 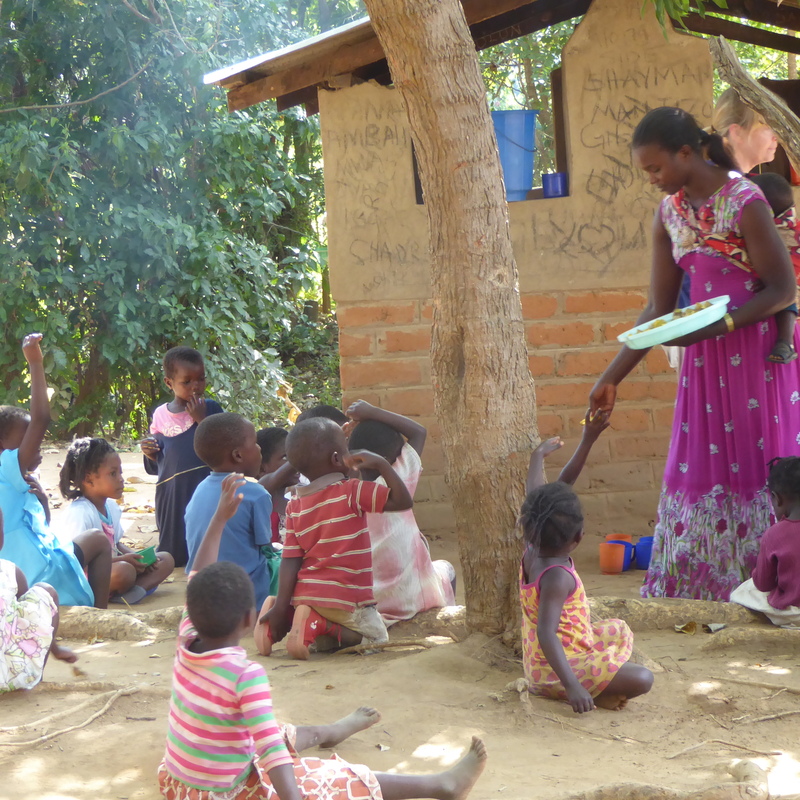 After class, but before being dismissed for the day, the students receive an after school snack. They each receive a piece of potato and a cup of sweet tea. A teacher is handing out potatoes. Here, Jenny, a volunteer from Ohio, is giving students the sweet tea. When they have finished their snack, the sit patiently waiting instructions from the teachers. Patiently sitting, waiting for teacher to dismiss class for the day. We were so impressed with the politeness of the young children. These are the four teachers for this group of students. Four extremely talented and dedicated teachers. They are such kind, patient and dedicated teachers. This another classroom of students. 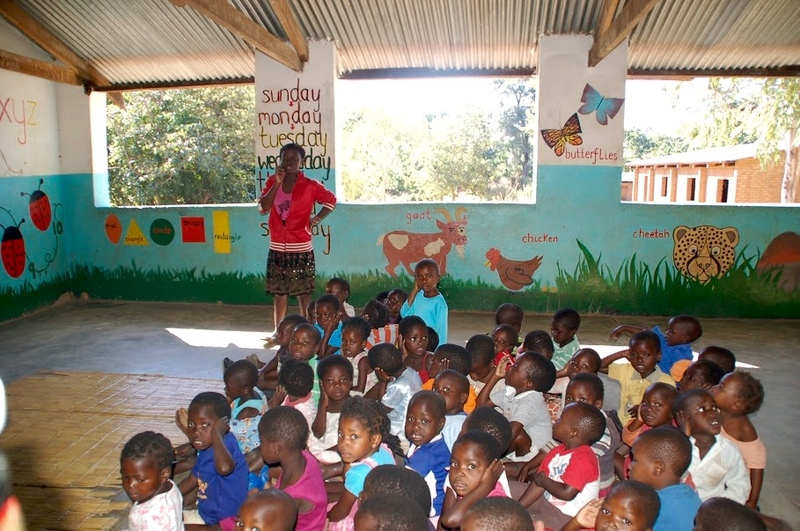 Ripple Africa, the organization we are with these two weeks, helps sponsor 8 elementary schools. 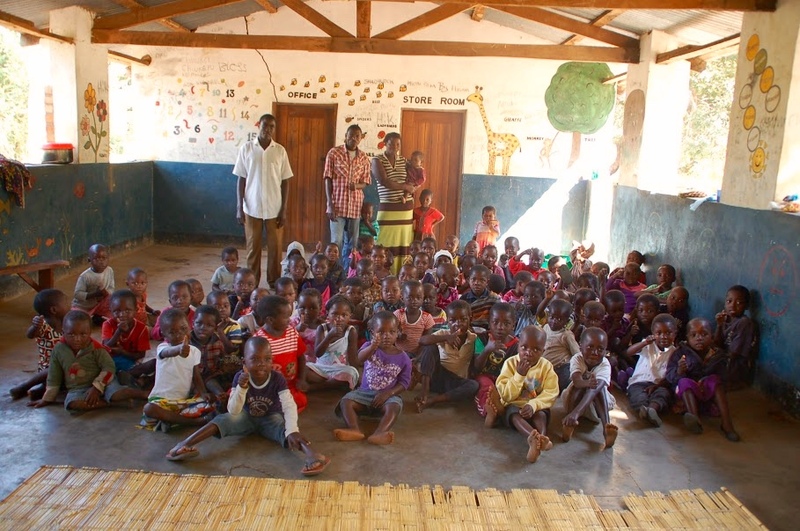 After I, Zeb theDuck, and the 6 volunteer women left, there was a graduation ceremony for the young children. My friend, Jenny, was invited and she wrote about her experience. 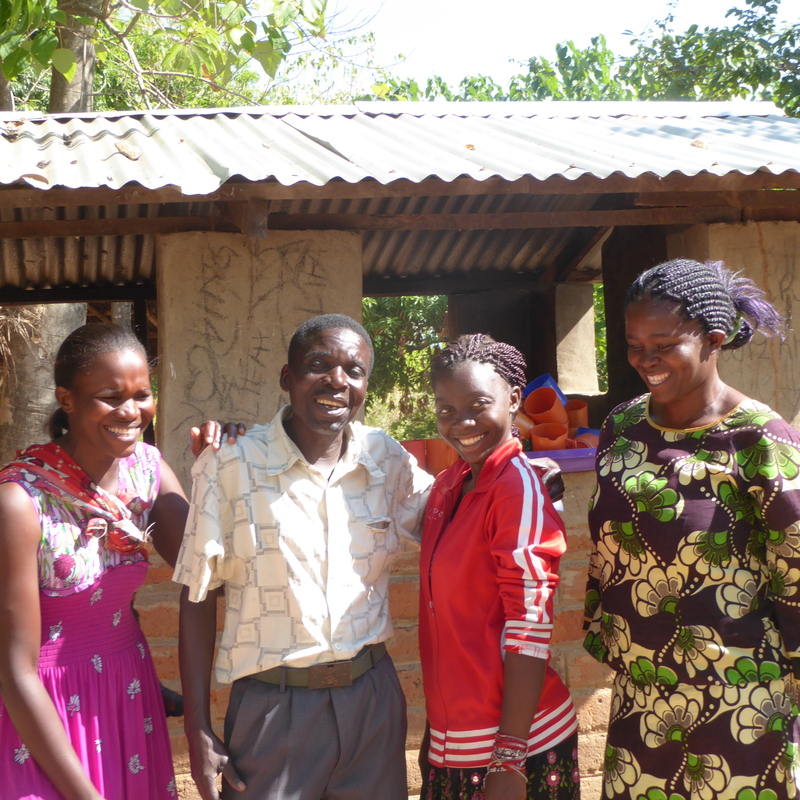 This shows how grateful the parents are and how Jenny was accepted by the community. We think you might enjoy reading this. 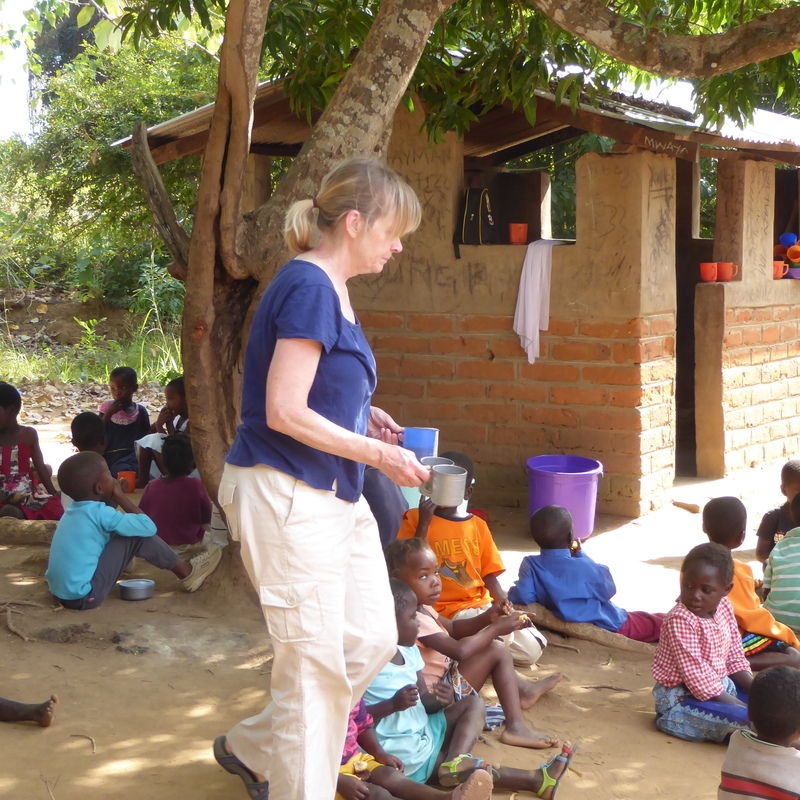 Go to http://www.RippleAfrica.org/ripple-africa-news/9750 We also worked with adult literacy. There are many adults that cannot read, but want to learn. They come to the library twice a week for reading tutoring. Here is the librarian. 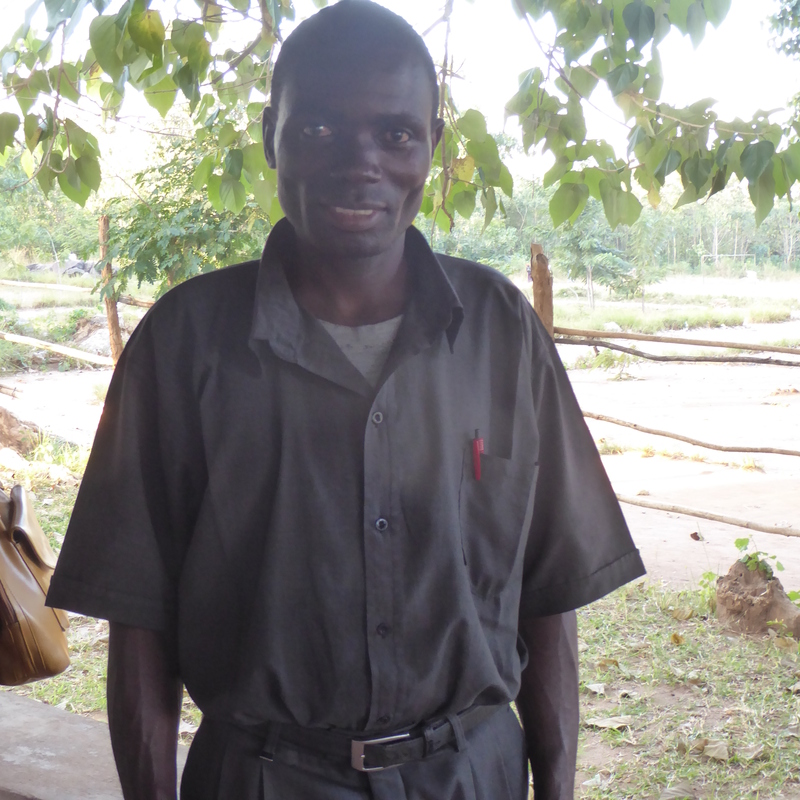 He heads the adult literacy program and teaches the classes. He has also written some short stories that have been published. He is very nice. Mom and some other volunteers helped him with teaching of adults. We enjoyed working with adults. 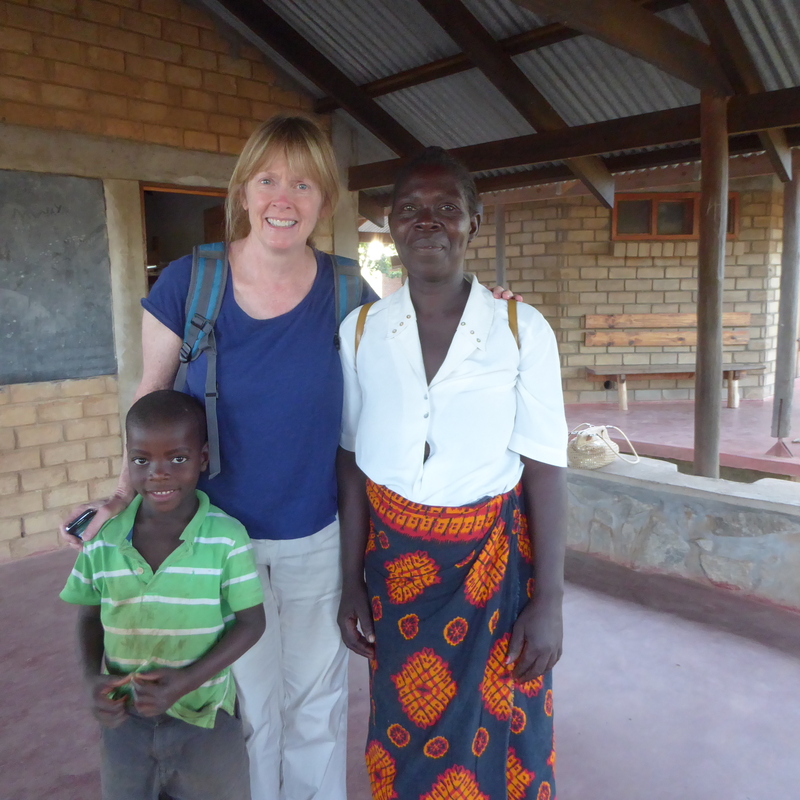 Here is Jenny, the volunteer from Ohio, with an adult student and a teacher’s child. We, the Colorado Traveling Ducks, believe that education is important, so we liked working with students of all ages. 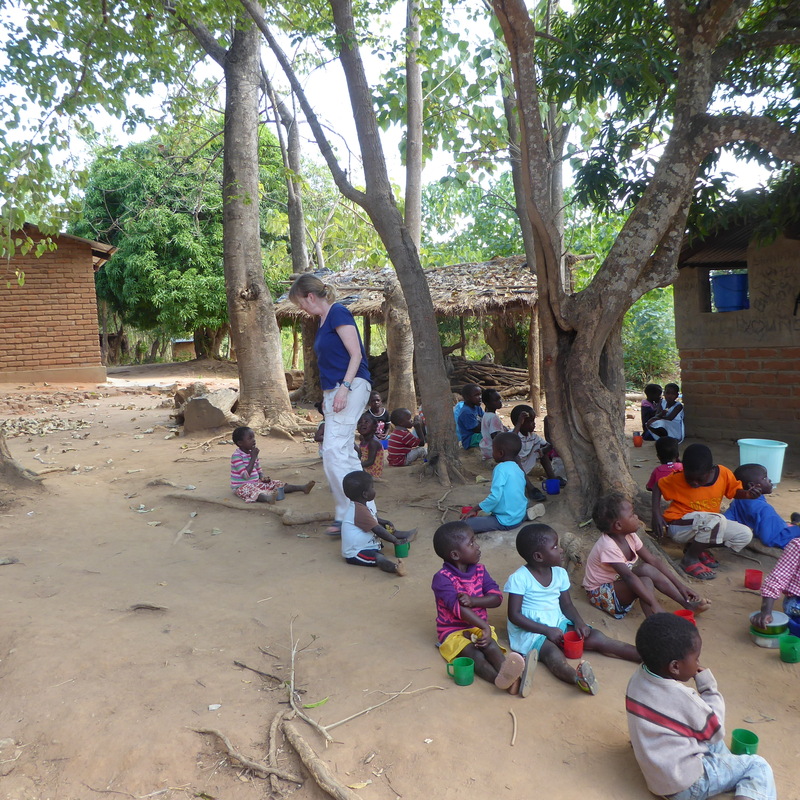 We want to thank Deborah for the photos of the children in classes. She is a very good photographer and she shared these photos with us. Mom didn’t have very good photos in classrooms. Thanks, Deborah. 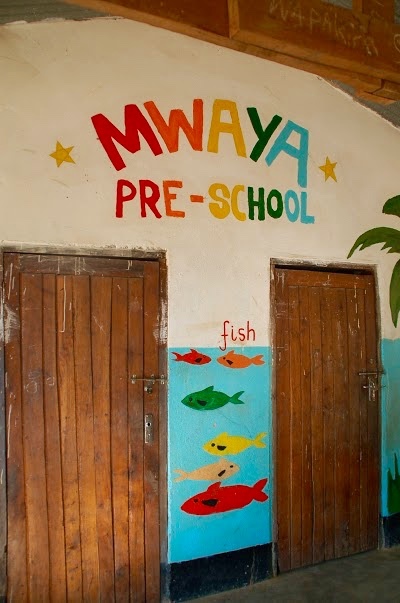 This entry was posted in Africa, Malawi, Uncategorized and tagged Africa, Colorado Traveling Ducks, elementary classrooms, Malawi, potato and tea snack, talented and dedicated teachers. Bookmark the permalink. 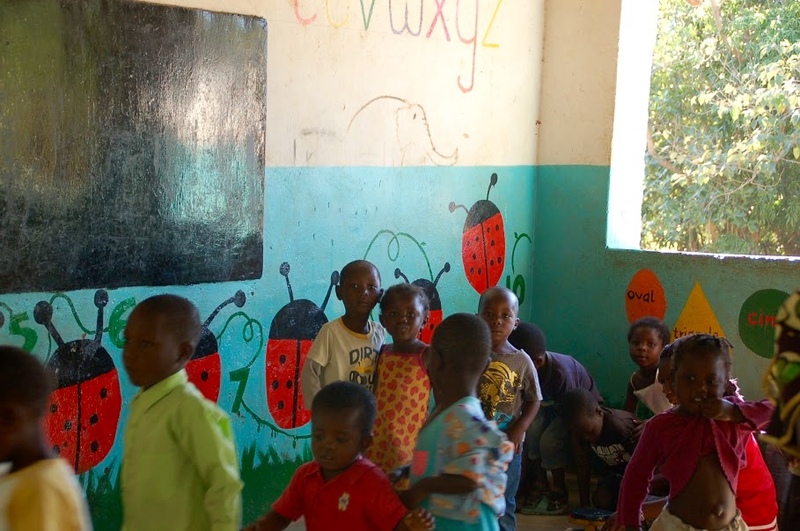 Photos of children in classroom were by Deborah. They are such wonderful subjects for pictures. Thanks for reading and commenting. It makes me really appreciate what we have at our school. These people make do with so little. It is amazing to see what they can do with no furniture and no supplies. Also much different from mom’s teaching days. Limited electricity severely limits all technology. Thanks for reading and commenting. I’ve been in classrooms in several countries that look just like your photos. They really can do so much with so little! It always amazes me what can be done. I taught teenagers for 30 years in US, so my experiences were so different. 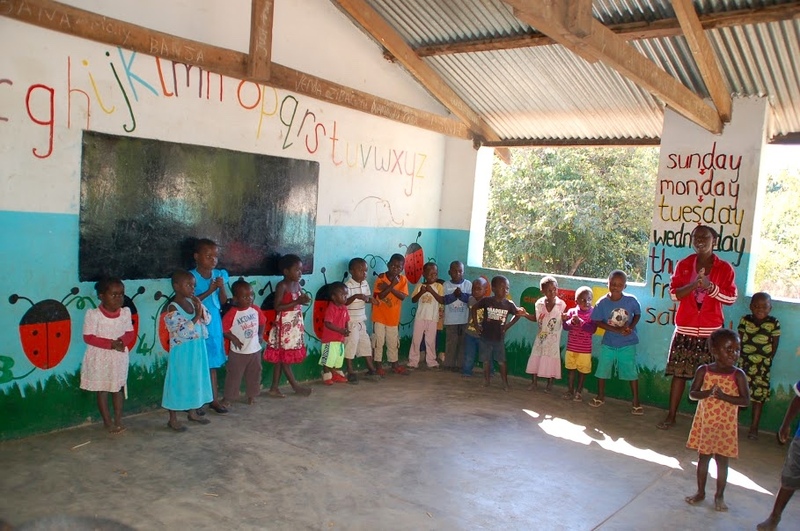 The children are so kind, polite and eager to learn. The teachers are incredible, also. I loved my job, but their circumstances are so different. Thanks for reading and commenting.